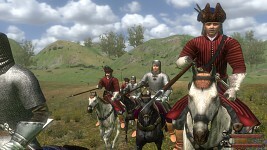 With Fire & Sword is the thrilling sequel to the action role-playing hit Mount & Blade: Warband. Be a mercenary or join one of the five battling factions to conquer, destroy or create empires. 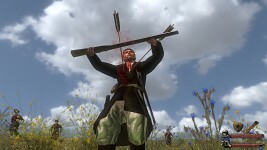 With Fire & Sword is the thrilling sequel to the action role-playing hit Mount & Blade: Warband. Be a mercenary or join one of the five battling factions to conquer, destroy or create empires. In an open sand box world you choose your allies, your enemies, what provinces to conquer, what castles to siege and what quests to embark on. We also have Mount & Blade: Warband and the original Mount & Blade available on Desura right now, with a stack of mods to boot! Get stuck into them if you cannot wait for the next installment. Same music as the original eh? Mount and Blade is all you need really - mods for it add what is in Warband. I think Fire & Sword only adds a story the player can follow but it's generally the same. I think I'll pass on this and wait for another Mount and Blade that changes the music, graphics and has true sieges with catapults. I got bored with Warband because it added little new and this seems to be the same really. The original however was great. Nah Warband is really what you need. The original has poor graphics and no multiplayer. Not with the latest patch. The retail version I brought has Warband graphics. The patch brings the graphics on par with Warband and even contains the same music. This is why I got bored with Warband. Also mods for the original add kingdom control. So apart from the missing mutiplayer, the original is pretty much all you need if you're a single player. Warband is optimized better, adds better modding options, and has better hit detection. I was wishing that they ported the game to the Warband engine after all this time. I've played the Russian release already. It would be nice if they decided to release the source code. No it doesn't stupid, the first one does not have HDR ******. Don't know who you're talking to Evil Angel but the original is on par in the graphics department with this new edition. Check out the screens for it. The retail version released in 2008 is the same graphics. The only difference with Warband is that armor textures are slightly different and the sky boxes look better but these sky boxes were mods for the original that Taleworlds used for Warband. Check out the The Revenge of Jdhihisswiherefj's trailer which uses the Expanded Gameplay III mod which adds improved textures for the world map that are better than Warband's map, new animations, sounds, armor and kingdom management. I am talking to you you noob, and I have both warband and the orignal, and warband is better, nuff said. Would've loved new music, sounds and animations. Maybe improved graphics as well, especially the unit models. views seem very mixed on this release. however, i see little to no difference in graphics, no music change and little innovation (no discredit intended). i mean, this is something mods can do, it just seems to be maps, skins and maybe sounds (for firearms). of course, the story will be interesting and good, and the price is also good. Wish I had Mount & Blade Warband at least...fun game. Get this, it is excellent value! Would if I had the money. Seems dying is expensive. I am torn , i love war band with all its mods - but do i really need this? Write some music and pay a high school band to play it for you. Seriously, some of the music in Mount&Blade: Warband sounds like something the Freshmen at my school would find easy. I'll wait till the next official expansion tbh. I've supported TaleWorlds since the start but this third party expansion seems really lacking compared to Warband (which introduced the political systems and new combat systems). I may pick this up when its on sale though.